This giveaway is now closed. Congrats to Patricia B! 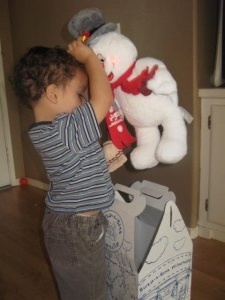 The other day, my little boy received the most adorable “box.” In fact, yesterday he told me that he needed to put his snowman in his house. Don’t you just love Build-A-Bear Workshop? Last year we reviewed Hal the Moose (which is just adorable!) and my son still loves to cuddle up with him! Build-A-Bear Workshop (if you’ve never heard of the store) offers children a unique opportunity to create their own stuffed animal. It’s an experience I’d really like to share with my son (when I’m not almost 8 months pregnant!). This holiday season, Build-A-Bear Workshop is offering an array of affordable gifts for children. A first for the company is their “Gifts on the Go,” a selection of “customized furry friends that are stuffed, dressed, and conveniently packaged in gift sets.” If you’re familiar with the store, then you know that children can create the bear from start to finish including stuffing, dressing, and boxing them up. If you’re an online shopper and don’t have time to run into the store, you can still purchase an adorable gift with prices starting at $15. Some stores will also feature a special Build-A-Gift station offering pre-stuffed animals and a selection of clothing and accessory options all in one place for easy access (available mid-November). There are so many options available at Build-A-Bear Workshop. One of their latest product offerings is a line of Alvin and the Chipmunks. My favorites are those that you can truly personalize in-store. You can also add an audible personalized message to any bear. I should also mention that any time you purchase a bear (or other animal) at Build-A-Bear Workshop, you can register that friend for free at Build-A-Bearville (it’s a virtual world where friends can hang out, play games and shop for cool virtual stuff). This year we received Happy Holidays Frost The Snowman. I’m always so impressed with how soft and cuddly their bears and animals are. He comes complete with a red scarf, broom, and pipe (they’re soft). When you lift his top hat, his cheeks light up and he makes a “magical” sound. You can also personalize him by a song, a giggle, a heartbeat or a message. He retails for $30 and is available for purchase now. There are at least 30 holiday furry friends available for the Christmas season, with prices starting at $20. They even sell adorable holiday clothing to dress your furry friend! And don’t forget that you can also find bears that retail for $10 and $12! Win It! 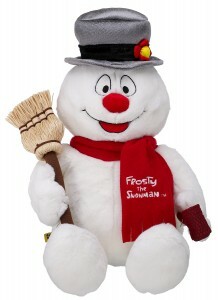 One of you will win a Happy Holidays Frost The Snowman! Simply leave me a comment with ANOTHER holiday furry friend you’d like to own! Comments will close on December 1, 2009 at 10 PM PST. One comment per person, please (unless you do the extra credit). US residents only. Duplicates and comments not including the above information will be disqualified. Comments are moderated. If you don’t see your comment in a reasonable amount of time, send me an email. Bloggers and non-bloggers may enter. If you don’t want to leave your email address, please be sure to check back for my announcement on the winner. Please note that winners must respond within 48 hours of being announced/contacted or another winner will be drawn. Check out my Holiday Gift Guide and leave a comment on that site about a product you like! (Maximum of 1 Comment for this). Enter Shannon’s giveaways (Maximum of 1 Comment for this). 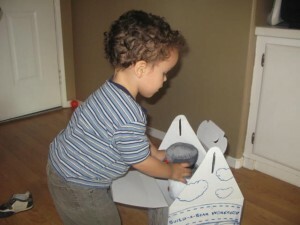 Profuse thanks to Build-A-Bear Workshop who provided the product for review. I would love to get the Super Star Jonas Dog for my daughter this holiday season, she would absolutely love that! Thanks so much for such a wonderful giveaway, so cute! I just saw the commercial for this today and loved it. I would live to have one of these for my 4 yr old, we don’t have a Build a Bear anywhere near us 🙁 I want to get my son a reindeer this year, he saw one at Walmart that has lights in his antlers. I also liked the 17″ Hello Kitty. I really like the Wilton Gingerbread Houses Kits from the Holiday Gift Guide, thanks again! Oh my goodness!!! Isn’t he the cutest! We had a BABW back in GA when we were stationed here. Joined their club and all! No such luck having one here 🙁 I do order stuff from them online though! I folow you on Twitter and tweeted! Zippity Learning System, I think is my favorite out of all the Christmas reviews so far! There are many others, but that one really stands out to me! I liked the Winter Warm Polar Bear and Just Chillin’ friends. Please enter me in your giveaway. Thanks! Left comment on Holiday Gift Guide. We really love the Winter Lace Winter Hugs Bear too! The Stylin’ Skater Winter Hugs Bear is really cute! The Holiday Gift Guide button is in my sidebar. I like the clarisonic classic cleaning system from your review guide. I also love the winter hugs bear! The Pilgrim Turkey would be great to own, but I also like the Bear that’s dressed up like an Elf. Really hope to win the Snowman because that’s my theme this year, I even made snowman ornaments for gift giving and for my home too! 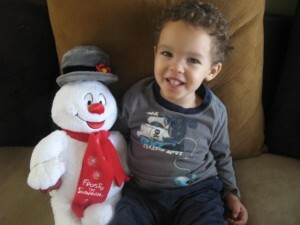 Yet, if I don’t win I know someone else will be really happy when they win this adorable Snowman. Step 2’s Lifestyle Party Kitchen if my first pick from your Holiday Gift Guide. Good luck to all. I also love the Winter Warm Polar Bear! I entered Shannon’s Wilton’s Cookie Exchange giveaway. Entered Dora’s christmas CD giveaway at the mommy files! The Winter Warm Polar Bear is adorable too! Another furry friend my daughter woudl like is the 15 in. WWF Gray Wolf. I am an email subscriber to your feed. I like the Santa Pawsome pony. Thanks for the chance. I love the Polar Bear!! My girls would love the Jonas & the High School Musical..thx!! entered Shannon’s Wilton cookie Exc. Restore Clean Water System by Homedics looks so awesome, would so love to have-left comment about it….thx so much!!!! Holy cow Holiday Elf Boy Curly Teddy is the cutest teddy ever! I would love to get him for my niece! I entered Shannon’s Mickey DVD contest! I really like the Santa Scruffy Puppy. He is so cute! Thank you! I left a comment on the Apple Grove Pals by Little Tykes. I hope it showed up. I entered Shannon’s Mickey’s Magical Christmas DVD giveaway. i love the Holiday Fun Portuguese Water Dog! My daughter would also like the Holiday Elf Girl Champ – A Champion Fur Kids. The Cuddly Cute Polar Bear is so cute! Thanks for the contest! Built a bear is the favorite store of my grandkids. This would make a great christmas present. Thank you for the sweep. I would love to have the Mrs. Claus Velvet Bear. SO ADORABLE!!! I love the Just Chillin’ Polar Bear Friends set.It is so cute. I think the Pawsome Pony is adorable! The Winter Lace Winter Hugs Bear is so adorable! I want her too! How cute are the Gingerbread Houses?! My little one would love the Holiday Hello Kitty® by Sanrio®. I love the So Pretty Polar Bear. She is so cute with her red sparkle “beary” janes. I entered the Mommy Files Pearl giveaway. I’d love to have the Stylin’ Skater Winter Hugs Bear. It helps quite a bit that it’s mostly blue. I entered the Mickey’s Magical Christmas DVD giveaway at The Mommy Files. The polar bear is really cute but the one my wife wants is the Frosty as she collects snowman. We got the catalogue the other day and didn’t dare show the kids. They don’t know they’re going in a few weeks for one of their birthdays. I like the mini Hocus Pocus. I would love the Wonderful in White Winter Hugs Bear. Thanks so much. Winter Hugs Bear is a sweet bear. I know my daughter would love it. The Mini Karen and Hocus Pocus from Frosty The Snowman woukd be cool. I think Gracie would like the Winter Hugs Bear. Thanks! I would also like the “Wonderful in White Winter Hugs Bear”. My daughter would LOVE the winter hugs bear. Thanks for the chance. love all of the giveaways, also entered Sesame Street!! The Snow Patrol Winter Hugs Bear is great! Thanks for the chance. I love the Winter Warm Polar Bear, so cute! I entered Shannon’s giveaway of the Christmas dvd. I love the frosty! The Santa Husky is adorable! Alison would love Santa Husky since it looks like our dog, Milele. I like the 16″ Hal Moose. THank you. I like the Hooray clothing from your holiday list. I think it’s fun to dress up the boys too. I like santa scruffy puppy. My daughter would absolutely adore the Holiday Fun Portuguese Water Dog. Cute and kind of a collectible, too. We love Build a Bear! I like the Winter Warm Polar Bear. Thanks! I’d love the Zebra! He’s so cute! My son really wants a bear with the Boy Scout uniform -we saw it in the store and he thought it was so neat that the bear could be dressed like him! My dd would love to own the Christmas Elf Hal Moose. Thanks! I would love to get Hal the Moose for my son. I know he would love the lights. My 3 1/2 yr. old daughter would love to get Karen*from Frosty the snowman* for christmas this yr. She would absolutley adore it and would be her new best friend! 🙂 Thank you and Happy Holidays! Other than Hal the Moose, which is the most adorable thing I’ve seen in a long time, I really love the Black Lab. I like the 16″ Hal Moose. I liked the 16 in. Hal Moose. Really cute. I also like the Holly Moose! I love the 16 in Polar Bear! I love the Scruffy Santa Puppy! I love the Santa Husky! They are all super cute! I like any of the mooses! they’re so cute! My daughter wants Holiday Elf Lil’ Chocolate Cub (boy)! I like the Stylin’ Skater Winter Hugs Bear! Thanks! Everything is so cute but I really love the Santa Scruffy Puppy. We also love the 14in Brown Sugar puppy. I love all the really soft, fuzzy teddy bears. I know there are a gazillion other animals but still, the bears are mine and my kids faves. Thanks for the opportunity! I totally love Holly the Moose, just the fact that it’s a girl moose makes me want to buy it! thanks for the giveaway! The Christmas Tree Lil’ Sweet Cream Cub really is cute! I really like the holly moose. I entered the megablocks table giveaway at Shannon’s site. My girls would love the Season Greetings Read Teddy plush. Thank you! MINI HOCUS POCUS!!! TOO CUTE! We’d love Hal the Moose! I also like Hal the Moose! I left a comment on your Cuisinart rice cooker post! I think the winter warm polar bear is so cute, and my daughter loves polar bears. Thanks. I love the Winter Lace Winter Hugs Bear. I like the Winter Adventure Holly Moose. I would like to own Christmas Elf Holly Moose.